Multiple projects & collaborators: A project is a collection of BioC documents. Users can create a project and share it with other collaborators. An owner can assign "Read", "Write", and "Admin" privileges to collaborators. Support BioGRID tasks: A project can be used in one of two modes, "Normal" or "BioGRID". In addition to a general BioC viewer as "Normal" mode, the PPI/GI manual curation tool is visible in the document viewer in "BioGRID" mode. Merge multiple BioC files: The viewer automatically checks whether there are multiple compatible files for the same underlying text document, i.e. files with the same source, date, key and document ID. If such compatible files are found, the interface asks users permission to merge those BioC files. Correct misaligned annotations: if misaligned offsets are identified, the viewer automatically corrects them by finding a match within the same paragraph. Users can download corrected files in BioC. 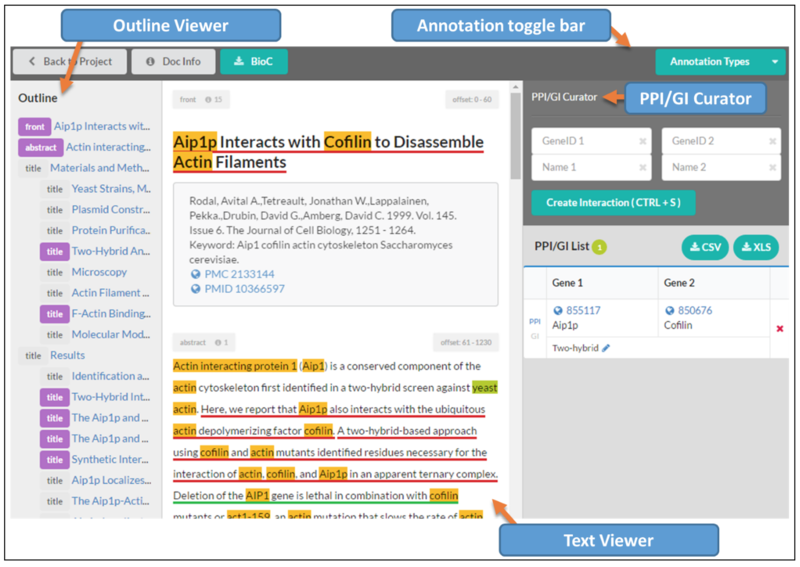 Full-text articles with highlighted annotations: The BioC Viewer highlights annotations using colors predefined in the annotation toggle bar. Outline viewer for easy browsing: Users can directly move to a section with annotated passages by clicking section titles. Automatic fill-in of normalized gene IDs (i.e. 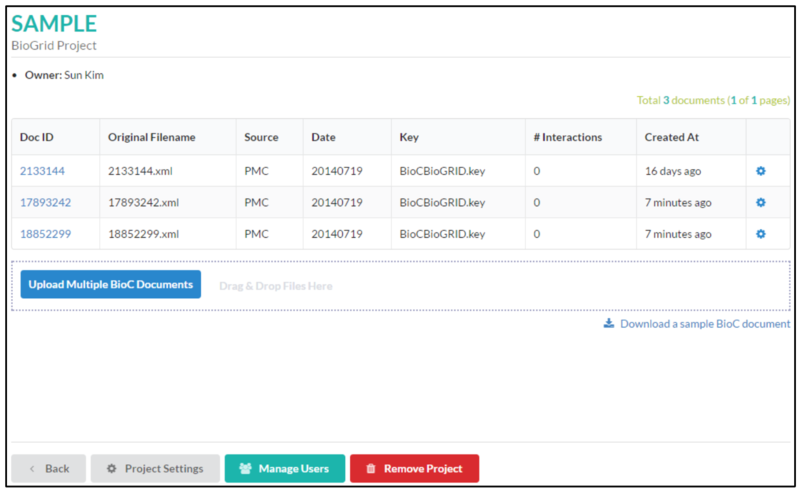 Entrez Gene IDs): If there are any IDs assigned to gene/protein mentions, a mouse click on annotated genes will automatically fill the necessary information in the PPI/GI curation tool. Manual edit of PPI/GI entries: Curators can edit PPI/GI entries if annotated gene/protein information is incorrect.